Microsoft made its holiday pitch Tuesday in New York, giving a sneak peak at what its gadget lineup will look like. 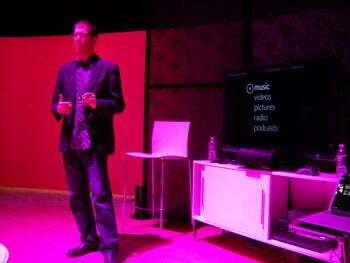 Here Microsoft stressed its portable music player Zune, Xbox, Windows Mobile 6.5 OS phones, and Windows 7. Microsoft's Robbie Bach, head of Microsoft's entertainment and devices division, said this season it will stress the integration of "lifestyles" with "work-styles." 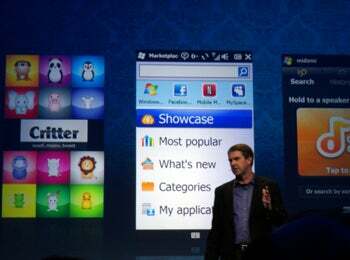 All eyes were on Microsoft's Mobile 6.5 operating system which was released today. The OS adds improvements to Internet Explorer Mobile, new navigation tools, Flash Lite support, and the introduction of Windows Marketplace for Mobile -- a new app store. To me, Windows Mobile 6.5 seems like a transitional step to a future OS -- might it be called Windows Mobile 7? -- that could pose a more realistic challenge to Android, iPhone, and other mobile operating environments on the consumer side. As for Zune and Xbox, Microsoft says it will be rolling out a new feature that enables content downloaded to one of these devices to be played back on the other. The video quality will support an impressive 1080p high-definition (HD) video. Microsoft Zune representatives say the move will represent the first in a series of steps by Microsoft toward greater integration between various Windows-enabled hardware devices. In attendance Tuesday were phone-makers Samsung, HTC, LG, Hewlett-Packard, and Toshiba, all delivering first looks at Windows Mobile 6.5 devices. Also on hand were mobile carriers Verizon Wireless, AT&T, Sprint, Telus, and Bell Mobility. Microsoft, though, faces increasingly visible competition from both the Google Android and Apple iPhone camps in a struggle to expand beyond its relatively good position in the corporate smartphone space. Today Verizon and Google announced a partnership to bring Android-based smartphones, PDAs, and netbooks to market later this year. At the CTIA show in Dallas, TX this week, Samsung and T-Mobile introduced the Behold II, a touchscreen phone that brings together the Linux-based Android operating system with Samsung's new TouchWiz user interface for one-touch access to the user's favorite features and applications.